The Qello iPhone, iPod Touch, and iPad app streams music concerts and documentaries that can be viewed on your Apple TV with the free universal download and a $4.99 monthly unlimited pass. Qello takes the next logical step in exploring, sharing, and enjoying music with its nice blend of Pandora, Spotify, and YouTube tools. You login to Qello with your email or Facebook account. The home screen features concerts in a matrix grid, as well as the Qello iPhone app tools accessed by finger swipes on the upper portion of the page. The top menu bar allows you to type in a search or explore it with a menu that slides on the screen from the left side. To efficiently explore the Qello iPhone app, I would recommend using the sliding left menu bar. You can check out featured concerts, new releases, curated selections, recommendations, and setlists. The recommendations tool is excellent, as it examines your iTunes music and suggests concerts and documentaries like Pandora. As you watch more concerts and select favorites, you can create your own setlist in a similar fashion to a customized Spotify play list. 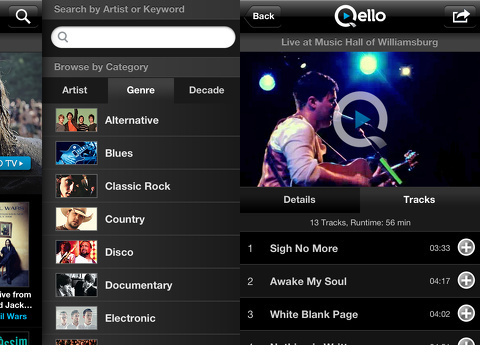 The quality and quantity of the concerts and documentaries make Qello a worthwhile investment for music fans. It streams quickly with clear video and crisp audio. The suggestions made by the Qello iPhone and iPad app were spot-on, insightful connections to my music preferences. The home screen spotlights music from many different genres, so certainly you’ll find something that interests you. If you love what you watch, you can share it with one touch to Twitter, Facebook, and email. The main problem of the Qello iPhone, iPod Touch, and iPad app is the dated, dull graphics. It reminds me of a dark, morose MySpace page. For an iOS app with a visual focus, it would make sense to invest in more sophisticated, modern branding. 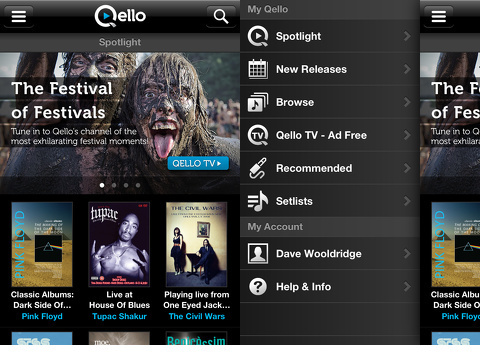 AppSafari review of Qello – Watch HD Music Concerts was written by Jenni Ward on August 1st, 2012 and categorized under App Store, Free, iPad apps, Movies, Music, Universal, Video. Page viewed 6730 times, 1 so far today. Need help on using these apps? Please read the Help Page. Thanks so much for reviewing our app! We’re getting a new creative person in and should have a great reboot for you in a few months.